Time is renewing, flowers are blooming, and the Easter bunny is going to bring painted eggs… All of these represent Easter is approaching, which is the most important religious feast of Christians, symbolized with rebirth, hope and inspiration, celebrated on Easter Sunday and is a good time for you to reconnect with your family and friends. 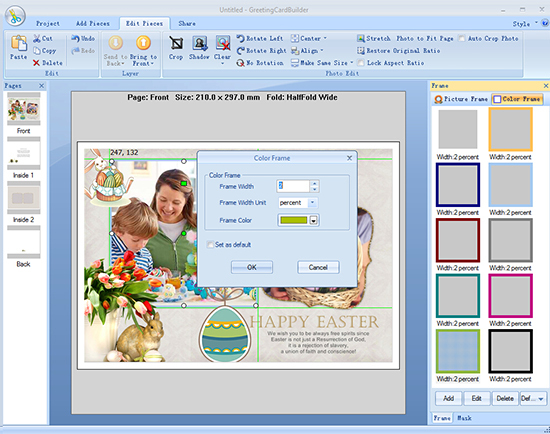 Whatever the choice of celebration, spending that day in church or with your family, there is a desire to make meaningful printable Easter greeting cards and then share with loved ones. 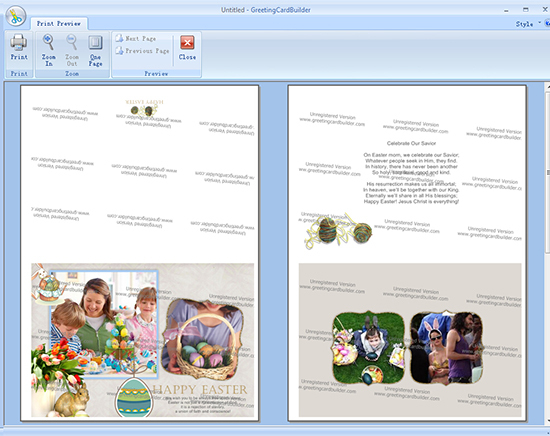 Find inspiration from this easy and quick Greeting Card Builder and get great Easter card ideas to spread Easter joy and happiness to the special people in your life. Making an adorable Easter card is not a difficult task. Now check the following simple steps. 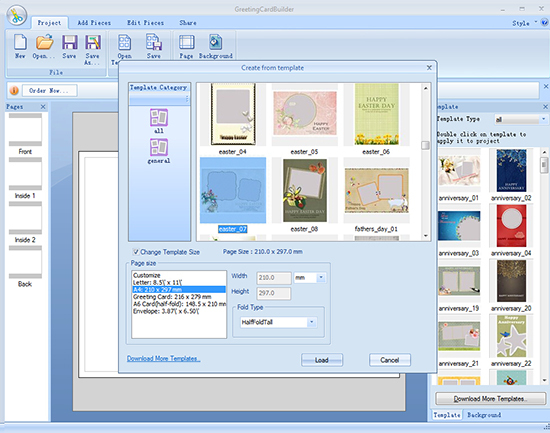 Open this card maker and click Create From Template button. There are so many stunning template types in popup window and then choose your favorite Easter template. 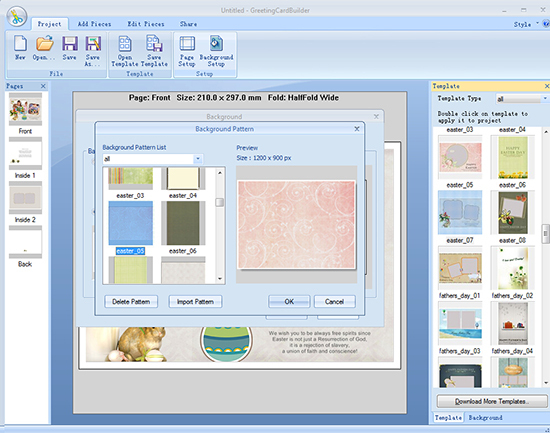 Once you have chosen which template to apply, you can freely to set page size by clicking Changing Template Size button. 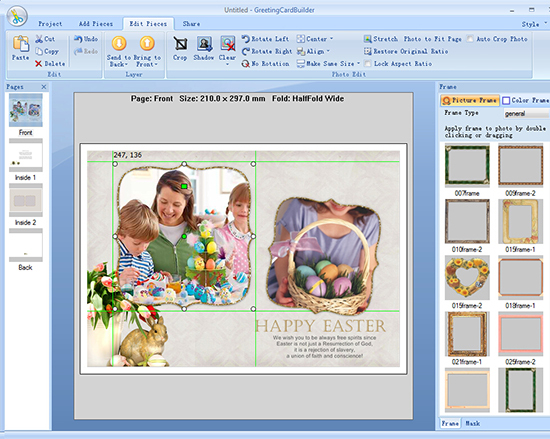 Adding Easter celebrating photos is a wonderful way to make that special day a lasting impression. Click Add Pieces → Add Photo button on top of window to add your fond photos from local disk to front page and inside page. 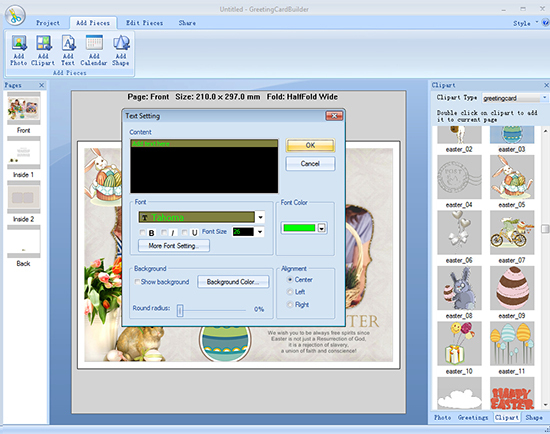 Here you can resize a selected photo directly by dragging mouse or do more settings such as crop, set proper layer, apply shadow effect, rotate, etc. by clicking Edit Pieces button on top. Easter bunnies, eggs and greeting wishes are symbols of holiday and should not be missing in the card decoration or as a highlight on every Easter card. Get all these done perfectly by adding clipart and text. Also, free to set background and add frame to make your card more personalized. 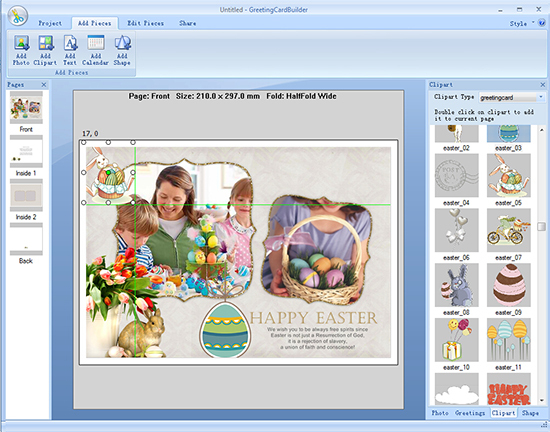 Click Add Pieces → Add Clipart button and then choose the best representative Easter clipart – eggs and bunnies or any other you want to apply. You can change their size to find the best place. Easter is considered as a celebration that represents new life and hope, so it is pretty important to type your heartfelt wishes on your card. Click Add Pieces → Add Text button to type your own deep wishes. Free to set font size and color based on your own needs. Click Project → Background Setup button on top of window and set your background by clicking Color Fill or Image. If you want to choose an image as background, there are abundant of images in Background Pattern List and then choose your favorite Easter image to apply. You can preview it on the right until it gets your last satisfaction. Click Edit Pieces button on top of window and then you will see two kinds of frames - Picture Frame and Color Frame on the right window. Select one photo to apply picture frame or color frame at will. Free to set frame width, width unit and color by clicking Edit button on the right bottom under the situation that you decide to apply color frame. Choose print as the sending option for your recipients. 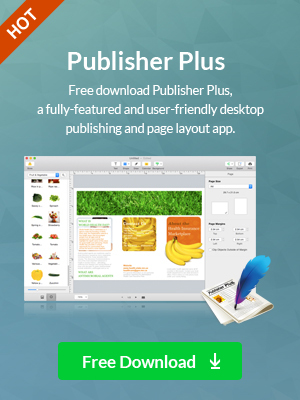 Click Share → Print button on top of window to print it out. You can preview it first to make sure every setting is fitting in nicely. Get creative Easter card ideas from this simple card maker and then greet your family and friends a happy Easter with this personalized printable Easter card that never loses its charm. It will bring you all together for a great celebration filled with lots of joy and happiness.